My lovely auntie informed me of this amazing recipe from the Facebook page recipe binder yesterday and whilst I usually like to create or adapt recipes (as you will see from all my other posts haha) this one was rather delicious as it was. I only made a few of my own amendments and this was mostly during the cooking and portioning process. It was so quick to make, so tasty and for so little points! My OH really didn’t believe that they were WW friendly. 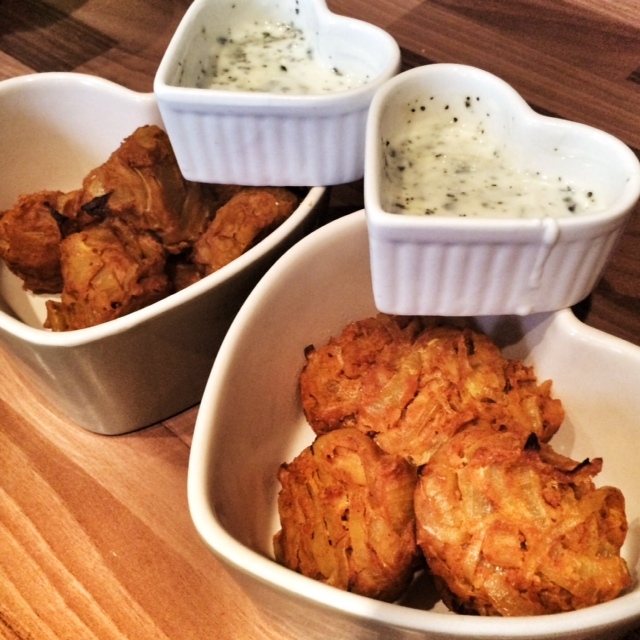 Make sure your oven is hot when you pop your bhajis in as you don’t want them to go soggy. To store pop into a box on top of some strong kitchen roll (to soak up any excess liquid created when cooling). According to the recipe builder 1 bjahi is 1sp, 2 bhajis is 1sp, 4 is 2sp and 8 is 4sp. Pre heat your oven to 180c and line a baking tray with some baking paper. Spray a large frying pan with 1kal (the biggest you have, there are lots of onions to be fried!) and once hot add all the onions and turmeric. Cook for around 20 minutes until the onions are nice and soft and have taken on the colour of the turmeric. Add a little water to stop the onions sticking if required. Take the onion mixture off the heat, pop into a large bowl and add all the dry ingredients including the chickpeas. Give a good mix and then add the tomato puree and egg. Mix again until well bound. Take around a tablespoon of mixture and roll into a rough ball, then flatten slightly. Pop onto a baking tray. This method should give you 16 bhajis! Spray bhajis with fry light, season with salt and pepper and pop in the oven for 20 minutes (or until nicely browned). While your bhajis are in the oven, mix 2 tablespoons of fat free natural yoghurt with a touch of mint sauce and some grated cucumber. Pop into a smaller bowl. Remove bhajis from oven, leave to cool a little (they will also firm up) and serve in a bowl with your yoghurt on the side. You could even add some salad with a little red onion. Oh my God these look amazing – I must remember them next time I go for curry! Thanks br00my, they are delicious! I made these on Sunday for yesterday’s dinner and they are amazing. I only have large eggs so they work out at 3PP for 4 and that’s still a bargain. 2 portions left, and I’ll just need to keep my sticky fingers out of the fridge until Friday night’s dinner. So pleased you enjoyed them saintdebs! We had these this evening with the Chicken Pathia. They were delish – they whole family enjoyed them. I’ve just come across this recipe going to give them a try tonight. Not a chilli lover so going to use a little paprika and black onion seed instead. My mouth is watering already. Just had these for a late lunch with soup and salad, lovely flavour. Thanks for doing this blog, it’s helping me to stay on track. Hi, Do these freeze OK? Would it be better to freeze the cooked/uncooked versions? I’ve heard lots of good reports about this recipe! MaryAnn I have frozen and reheated cooked ones and they have been fine, can’t remember timings but keep an eye on them as they don’t take long even from frozen. Thanks for your reply Laura… I’ll try either (or both) of those ideas instead then. Made these tonight. Hubby was really surprised at how good they tasted. Just made these and they are lovely, and are the most authentic look and Taste wise I have found! Can’t wait to finish them with dinner tonight! Thanks for the recipe. I made these and oh my goodness they are gorgeous. Took them cold as part of a picnic too. Brilliant a recipe I will use again and again. Thank you.